To sign up for a Simply Testable account you provide your email address and choose an account password. Submission of that form is a sign-up request. The submission of the sign-up form for purposes other than creating an account is a spammy sign-up request. We received about 3,500 spammy sign-up requests over the past 30 days. That’s about 3,500 more than I’d like. Conditional comments are a special HTML comment syntax that will be ignored by all browsers except IE. To be ignored is the only purpose of a comment. Unless, however, you’re dealing with IE conditional comments, in which case the contents of a comment will pretend to be HTML under the correct conditions. Should we ignore all comments even though they might refer to resources that require CSS validation? This is something I decided I needed to look into. I’m really quite sure that the results of such tests are of no value and that almost no-one uses this feature. Does (relatively) anyone use this feature? Let’s flex our SQL fingers and see whether my assumptions match reality. This change seemed a good idea at the time. It may well have been a good idea at the time. Our 120th updates newsletter went out today. Our 119th updates newsletter went out today. Our 118th updates newsletter went out today. Our 117th updates newsletter went out today. Our 116th updates newsletter went out today. Our 115th updates newsletter went out today. Our 114th updates newsletter went out today. Our 113th updates newsletter went out today. Our 112th updates newsletter went out today. Our 111th updates newsletter went out today. Last Friday I deployed some changes to how test tasks are farmed out to workers. This has resulted in a 46% increase in task throughput and has nearly halved the amount of time it takes to carry out a test. Our 110th updates newsletter went out today. Our 109th updates newsletter went out today. Our 108th updates newsletter went out today. Our 107th updates newsletter went out today. Our 106th updates newsletter went out today. Our 105th updates newsletter went out today. Our 104th updates newsletter went out today. Won't This Result In Fewer New Signups? Simply Testable Updates #103: Oh My Goodness, Ready To Run Ads!!1! Our 103rd updates newsletter went out today. Our 102nd updates newsletter went out today. Our 101st updates newsletter went out today. Our 100th updates newsletter went out today. We all work in teams to achieve more than we can as individuals. 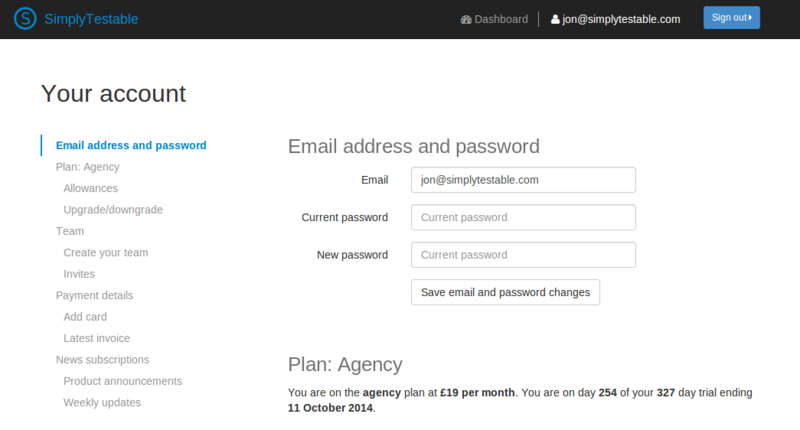 The Simply Testable account page evolved slowly as new features were added. It is now new again, shinier and easier to use. It wasn’t always so. Our 99th updates newsletter went out today. Our 98th updates newsletter went out today. Our 97th updates newsletter went out today. Our 96th updates newsletter went out today. Simply Testable from the perspective of a service offers automated frontend web testing. From the perspective of a product, Simply Testable offers the aforementioned service at a cost in a way that provides value to the user. Our 95th updates newsletter went out today. Our 94th updates newsletter went out today. Our 93rd updates newsletter went out today. Our 92nd updates newsletter went out today. Our 91st updates newsletter went out today. Our 90th updates newsletter went out today. Our 89th updates newsletter went out today. Our 88th updates newsletter went out today. Our 87th updates newsletter went out today. Our 86th updates newsletter went out today. Our 85th updates newsletter went out today. Our 84th updates newsletter went out today. You might think that coding up the reliable retrieval of a resource at a given URL over HTTP is easy. You’d be wrong but quite forgivably so. Our 83rd updates newsletter went out today. Our 82nd updates newsletter went out today. You can now specify cookies to be set on all HTTP requests made whilst running your tests. Our 81st updates newsletter went out today. Our 80th updates newsletter went out today. Our 79th updates newsletter went out today. Our 78th updates newsletter went out today. Our 77th updates newsletter went out today. Our 76th updates newsletter went out today. Our 75th updates newsletter went out today. I today expanded the range of doctypes we support when carrying out full-site HTML validation and significantly improved the way we check if you’re using a valid doctype. Our 74th updates newsletter went out today. Our 73rd updates newsletter went out today. Our 72nd updates newsletter went out today. Our 71st updates newsletter went out today. I’ve been working for the past two or so weeks on adding the ability to run tests against password-protected sites. Our 70th updates newsletter went out today. Our 69th updates newsletter went out today. Our 68th updates newsletter went out today. Our 67th updates newsletter went out today. Our 66th updates newsletter went out today. Our New Test Dashboard and Test History Launched! From day one the main focus of the service was on letting you run full-site tests that always worked. A couple of weeks ago, around a year after the MVP launch, it did. The service works, all the time, for any website *. Our 65th updates newsletter went out today. Our 64th updates newsletter went out today. Our 63rd updates newsletter went out today. The goal all along of Simply Testable has been to let you easily run a set of frontend tests against any website of your choosing with the minimum possible effort. Our 62nd updates newsletter went out today. See that list of error counts towards the right-hand side above? Our 61st updates newsletter went out today. Our 60th updates newsletter went out today. Our 59th updates newsletter went out today. Our 58th updates newsletter went out today. Our 57th updates newsletter went out today. Our 56th updates newsletter went out today. This wins the prize for being a long time coming. Our 55th updates newsletter went out today. Our 54th updates newsletter went out today. Introductory email course to help new users get the most out of the service. The Simply Testable service lets you run a set of frontend web testing tools against your entire site all in one go. Our 53rd updates newsletter went out today. Our 52nd updates newsletter went out today. Our 51st updates newsletter went out today. When preparing a documentation page to cover the generic HTML validation error Element "X" undefined I started researching the causes for some specific instances of this type of error. Our 50th updates newsletter went out today. Our 49th updates newsletter went out today. This week I ran lots of analysis to identify the most common specific HTML validation errors and the most common types of error with the aim of generating help pages to provide explanations of, and possible solutions for, the HTML validation errors you may encounter. Our 48th updates newsletter went out today. Today I launched our premium plans. All come as standard with a 30 day trial (or 365 days if you upgrade before 31 July 2013). I wrote recently about the newly-launched premium plans. Our 47th updates newsletter went out today. Our 46th updates newsletter went out today. No progress this week as I had to look after my cat with a broken leg and I had to move house so that I could more easily look after my cat with a broken leg. Our 45th updates newsletter went out today. Our 44th updates newsletter went out today. This week has been entirely focused on accepting payments for premium plans. I use Travis CI as a secondary continuous integration (CI) service to help ensure that each Simply Testable application works in isolation as expected when code changes are made. Following some recent changes I noticed that the PHP 5.3 build failed due to it hitting a memory limit running unit tests. Our 43rd updates newsletter went out today. This week has been entirely focused on integrating with Stripe (our payment partner) and introducing premium plans. Our 42nd updates newsletter went out today. Our 41st updates newsletter went out today. Our 40th updates newsletter went out today. I’ve finished putting in place limits on free demo tests. I’d like to explain what free demo tests are and the limits that apply to them. Running a single-URL test just got faster! Limits are starting to be applied for totally free full-site and single-URL tests. When performing a single-URL or full-site CSS validation, you can choose to ignore CSS validation errors from chosen domains. For those of you who have an account, you now have an account page! Our 39th updates newsletter went out today. Our 38th updates newsletter went out today. Our 37th updates newsletter went out today. I’ve spent the past 4 weeks (or so) switching from our own HTTP client library to a third-party HTTP client library called Guzzle. Our 36th updates newsletter went out today. This week has been entirely spent continuing the work to switch the core application and the web client over to the Guzzle HTTP client library. Our 35th updates newsletter went out today. Our 34th updates newsletter went out today. Providing feedback during a long-running operation is a very good idea. When viewing a full-site test as it progresses you are shown the percentage of the test that is complete. What bothered me what that you would have no idea how long it would take for the test to finish. Staring intently at the various progress indicators that you are given can give you an impression of how long the test will take to finish but that’s hardly a good use of your time. Our 33rd updates newsletter went out today. I learned yesterday from @johnholtripley that CSS background image data URLs were presenting CSS validation errors incorrectly. By this I mean that the CSS validator was saying there is an error when there was not. Let me quickly explain what data URLs in CSS are for this to make sense. Our 32nd updates newsletter went out today. Today has been focused on fixing bugs that just so happen to all relate to content retrieval. With the volumes of web pages retrieved and tested daily by Simply Testable, I always think I’ve seen all the ways in which people produce HTML incorrectly. With the volumes of code I write daily for Simply Testable I always think I’ve covered (nearly) all the ways in which content retrieval can go wrong. I’m still amazed by what I find. Our 31st updates newsletter went out today. I’m putting in place a data recovery plan to ensure we’re never again left with nothing should we ever again lose both hard drives in our production server at the same time. I can’t back up everything. It takes too long and the resulting backup is too large. I’m writing an article about that to be posted soon if you’d like to know more. For now, it’s enough to know that backing up everything is not feasible. Choosing what data to include in, or exclude from, an application backup is not easy. Here’s how to make it easy. Account creation was launched back on 9 November 2012. As a feature, and in line with releasing early and often, it was released with the bare minimum to work. What the sign in form lacked at that stage was an option to let you stay logged in. Our 30th updates newsletter went out today. In the middle of January we experienced major downtime and data loss due to the failure of both hard drives in our production server. Although this was about as bad as it gets, I’m glad it happened now whilst we’re still somewhere between the alpha and beta stages and before we introduced any paid plans. At the time, the backup plan was … non-existent. There was no such thing. My thinking at the time was that the risk of losing all our data before I had a chance to put a backup plan in place was minimal and that there’d be plenty of time to work on a recover strategy once the service was generating revenue. Clearly my thinking could not have been more wrong. We’ve had a problem viewing the results of large tests for a long time. If you started a new full-site test on a site with thousands of URLs, closed your browser, went home, returned the next day and opened up the results page for your test, you’d very likely not get anything useful. Most of the time you’d get a rather unglamourous 503 Service Unavailable error page resulting from an uncaught application error. If you were lucky, you’d get a more graceful application error page and the details of the error that happened would be emailed to us. Our 29th updates newsletter went out today. Our 28th updates newsletter went out today. Our 27th updates newsletter went out today. Our 26th updates newsletter went out today. The recent emergency maintenance is now all complete. Our 25th updates newsletter went out today. This week has been most notable for the complete failure of the service due to both hard drives failing in the production server. Last night I gave a talk titled “3 Non-Code Production Improvements For Developers” at the January 2013 Unified Diff meetup. A big thanks to @HandyBiteSize, @gavD_UK and @rodnaph for continuing to organise the events, as well as @craigmarvelley for helping me get my laptop connected to the projector. Slides and my initial preparatory notes are available at https://github.com/webignition/udiff-jan-2013. Our 24th updates newsletter went out today. Such tests would fail without completing correctly, leaving the test appearing to be stuck in progress and never completing. This was not good. If you have non-HTML URLs in your sitemap, such as URLs for PDFs, HTML tests for such URLs will be marked as ‘skipped’ to indicate that the test was not run due to it not being relevant. Our 23rd updates newsletter went out today. Thanks to the feedback from @igll, internationalised domain name (IDN) support has been improved. Our 22nd updates newsletter went out today. Our 21st updates newsletter went out today. I’ve recently been adding some options to CSS validation tests to make the tests more useful. Or, depending on your perspective, to make CSS validation useful where it previously was not. Across a short series of blog posts, I’d like to look now at why CSS validation options are needed, the range of options I considered, where I got the options from and how I decided on which of these to implement. Our 20th updates newsletter went out today. Our 19th updates newsletter went out today. Since I need to do this on a number of Ubuntu servers, and since this may be of use to others running Ubuntu or Debian systems, here’s how to do it. It broke for 6 days. Our 18th updates newsletter went out today. Since the introduction of CSS validation two weeks ago, any new full-site test ran both HTML and CSS validation for all URLs. Our 17th updates newsletter went out today. CSS validation is now live! Account creation is now live! You can now sign up for your free account. Our 16th updates newsletter went out today. Our 15th updates newsletter went out today. Account creation is mostly complete locally. Tests you start when logged in are private to you. When retrieving URLs from compressed sitemaps, we no longer care what Content-Type accompanies the sitemap; HTTP headers lie. I’ve been asked a few times if it’s possible to test a local website. You can. Here’s how. Our fourteenth updates newsletter went out today. I recently upgraded all local development and CI systems from Ubuntu 12.04 to Ubuntu 12.10. This killed the local installations of the W3C HTML validator. If the same happened to you, here’s how to fix it. Our thirteenth updates newsletter went out today. Friday saw us featured at webreourcesdepot.com. This brought in about 8x the previous traffic numbers and more or less killed the service. Sunday saw us featured in a tweet from @smashingmag, bringing in about 4x Friday's traffic, most certainly killing the service. The start of this week was a constant effort to kill off long-running tests to bring load down and examine how to stabilise the service. Yesterday saw the deployment of batch task assignment, reducing the number of Apache processes needed. Today saw the switch from Apache to Nginx, bringing the service back up to speed even under high load. We’re changing the web server Simply Testable uses from Apache to Nginx. We launched publicly last Wednesday. Launching didn’t mean making the service available - it had been live on the web at simpytestable.com for two weeks and before that at alpha1.simplytestable.com for about two additional weeks. Friday saw us mentioned by WebResources depot to their 35,000 RSS subscribers. Capacity problems followed. We coped, but only just. A problem of which I’ve been aware for a while and which was the root of significant problems for yesterday’s MVP release relates to how test tasks are assigned out to workers. A process runs every few seconds and picks a small number of tasks from each incomplete test and marks them as being ready to be assigned out to workers. This process was introduced to ensure that many tests can run in parallel. Prior to the introduction of this process, the tasks for a new test would be assigned out to workers at all in one go. Subsequent tests would be delayed in starting until the workers had process the tasks of all previous requests. Simply Testable Updates October 2012 #2: Public Launch Day! Our twelfth updates newsletter went out today. I submitted a 'Show HN' post to Hacker News. It didn't garner much interest but it did receive a comment from someone I don't know which was very valuable. The service was reviewed by a group of ex-colleagues who promptly caused widespread breakage. I submitted the service to be listed at webresourcesdepot.com/. A competitor is listed there and so I thought I'd try the same. The URLs to be tested when running a full-site test are gathered from a website’s sitemap. A sitemap can list a collection of URLs for your site. A sitemap can also act as an index listing a collection of sitemaps. Your robots.txt file can also list many sitemaps (despite this not being part of the standard). Up until just a few minute ago, we supported only the first type: a sitemap that listed a collection of URLs for your site. I rewrote our sitemap finder, sitemap retriever and sitemap model libraries to support multiple sitemaps and sitemap indexes so that all sitemap uses are supported. If your robots.txt lists a sitemap index URL, we’ll now read the index and read in all the referenced sitemaps and extract all URLs across all sitemaps for testing. If your robots.txt lists multiple sitemaps and are not using a sitemap index, we’ll just grab all those sitemaps and extract all the URLs across all sitemaps for testing. People have nice things to say about Simply Testable! I added today to the footer of simplytestable.com some of the love that’s been received so far from @jenko and Matcha Labs. Have you tried Simply Testable and found it useful? Do you think it’s a great idea and something you’d find valuable? Let us know: send a tweet to https://twitter.com/simplytestable or send an email to jon@simplytestable.com, including, in addition to whatever you’d like to say, the link you’d like placed below your quote. I can’t try and buy your love and I definitely won’t consider adding you to the list of those getting free access to the subscription pro service coming in the next few months. That absolutely will not happen. A little vague perhaps, but certainly a worthwhile improvement tackling a very significant problem. It’s the last big problem that was preventing a smooth running service. Now that it’s resolved, I’ll look a little at what the problem was and how the solution was put together. Timeouts. Sometimes they just happen. Up until very recently, a timeout when trying to perform a HTML validation test for a URL would leave the test stuck as being in progress. This prevented the full site-wide test from ever showing as 100% complete, often getting stuck at 90-something percent. In any of the above three cases a test will be marked as failed and when viewing the results of a test you’ll get a brief description of why the test could not happen. Our eleventh updates newsletter went out today. I’ve been asked a few times, most recently by the guys at Matcha Labs, what tech simplytestable.com uses and how it all works together. Our tenth updates newsletter went out today. Redirect loops are no fun. You visit a URL and it 301 redirects you to another URL which 301 redirects you to another URL which then eventually redirects you back to where you started at which point the fun begins again. Redirect loops are no fun because you never get any content for such a URL, you just get redirected indefinitely. Long redirect chains are no fun. You visit a URL and it 301 redirects you to another URL which 301 redirects you to another URL which 301 redirects you to another URL … and so on. You don’t get redirected back to a URL you have already visited whilst riding this redirectercoaster so it’s not a redirect loop. You might eventually get redirected to a URL that doesn’t redirect you any longer. Or you might not. One cannot in advance tell. A full-site test that aims to carry out a set of tests against every URL for a site needs to get the URLs from somewhere. Our ninth updates newsletter went out today. Today I spotted a second case where an HTML validation test doesn’t complete properly - redirect loops. Up until yesterday we had no way to spot a failed test. I’m referring not to a failure such as an HTML validation test finding errors but a test that fails to run at all. In investigating production bug #001 I noticed some web pages were trying to specify the character encoding used but were doing so incorrectly. Following yesterday’s private alpha release, I was trying to figure out why some HTML validation tests were failing. Our eighth updates newsletter went out today. the private alpha was released! The private alpha release is now available: http://alpha1.simplytestable.com/. You can run full-site HTML validation tests on any site that has a sitemap.xml file; it’s from the sitemap that the URLs to be tested are retrieved. Our seventh updates newsletter went out today. An update to the third prototype demonstration; the results page is displayed once a test completes and the details of the errors encountered can be examined. Our sixth updates newsletter went out today. An update to the second prototype demonstration; an indication of the number of errors encountered in a test is displayed as the test progresses. An update to the first prototype demonstration; the list of URLs being tested against is dynamically updated as they are discovered and tests against them are performed. A quick demonstration of the latest working prototype running a site-wide HTML validation test. Our fifth updates newsletter went out today. I reached a significant milestone today: the first real test was run. I completed the integration of the W3C HTML validator (with HTML5 support) into the worker HTML task driver, an overly technical way of saying that HTML validation tests are now performing actual HTML validation and reporting the results back to the core application. Our fourth updates newsletter went out today. We use the W3C HTML validator for driving HTML validation tests. We don’t use the W3C public service at http://validator.w3.org/; the usage limits imposed (quite fairly) by the W3C are too restrictive for our needs, and the latency involved in sending HTML out to the Internet to be validated increases by orders of magnitude the time it takes to complete an HTML validation test. We install a local copy of the W3C HTML validator and a local copy of the Validator.ru HTML5 validato. If you want to frequently validate many HTML documents quickly, here’s how you can do the same. Our third updates newsletter went out today. We use a job system to handle the queuing and running of tasks asychronously with respect to the application flow. Actions that could get in the way of things running smoothly and which don’t mind when they happen are put into a queue to be run later. This covers tasks such as the core application verifying a worker’s activation request, expanding a new test job into a set of test tasks or farming out test tasks to eager hungry workers. I created some libraries for dealing with certain matters that would be common across the Simply Testable service. Such libraries address generic matters that should be useful to others. They have been open-sourced under an MIT license from day one. In /opensource-libraries-weve-created-and-how-we-use-them-part-one-url-handling/, I talked about what we use for handling URLs. In part two point one of this series, I talked about how we deal with many HTTP requests reliably. In part two point two in the series of opensource libraries we’ve created I’ll talk about how we test HTTP-based applications. In preparation for that, let’s look at what can go wrong such that your HTTP conversation fails and what you need to test for to ensure that your HTTP application copes with such failure. This goes beyond HTTP-specified 4xx and 5xx errors and examines failures that result in no HTTP response being received. Our second updates newsletter went out today. Such libraries address generic matters that should be useful to others. They have been opensource under an MIT license from day one. In part one of this series, I talked about what we use for handling URLs. In part two point one, I look at what we’ve created and use for handling HTTP requests reliably. Part two point two will expand on this and look at how we test HTTP-based applications. Our first updates newsletter went out today. Tasks are where all the fun is. Tasks (ultimately) give you the insight into what is right or wrong about your site. Tasks give us a fun place to play around with testing against specific quality factors. A client such as the web interface, an iOS app or an Android app, sends a site test job request to the core application. The client reports back to the user on the status and progress of the job and presents the results of the test once complete. Simply Testable is launching publicly October 2012, about 12 weeks from now. It will allow users to perform a range of quality-related technical and non-technical tests across a given web site. This is a story of how I came to be sitting here writing about developing a brand new professional automated web front-end testing service.